Many a times, one of the search results for your computer related problems is a link to a website called Experts Exchange. Now Experts Exchange is a very famous trouble shooting forum for people whose technical knowledge range from both a newbie to a professional. Experts Exchange caters everyone's needs. In order to get help from this forum you have to become a paid member for which the charges are like 13 USD monthly (or around 500 INR). In this article we will tell you a way in which you can get an accoun on the Expert Exchange forum totally free of any charge. 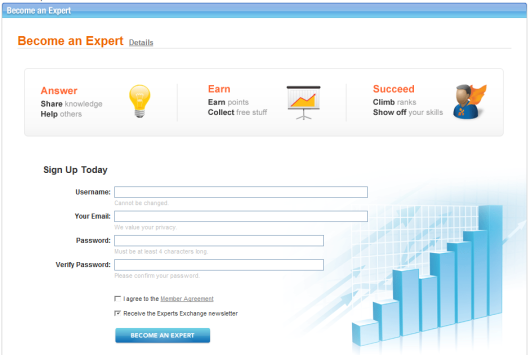 In order to get your free account all you need to do is just visit this link: https://secure.experts-exchange.com/jsp/registerExpert.jsp or this link. You will be taken to a new page where you can register your free Experts Exchange account and take full advantage of the content at the forum. This is a limited free account that lets you view only the solutions to select answers and not all questions. But you can unlock the premium account which has all previleges by replying to the questions raised in the forum. Each correct and helpful reply earns you points ranging between 200 to 500. You just need 10000 points to unlock the premium account. And believe me, I actually got mu premium account in this way, without paying a single penny!